This is going to be the first Holiday Gift Guide for ISTYLEU and frankly I'm looking forward to it. Every week leading up to Christmas, various products will be featured here to give your woman (or friends and family) ideas of what to give you for Christmas. So make sure to have them visit ISTYLEU regularly. There will be fragrances and there will be gadgets. There will be male style essentials and there will also be accessories. There will also be some fairly high priced items for those that have some extra cash to spare. And as we get close to the big day, there will also be some last minute gift ideas for the shoppers who procrastinate. Right now, I can tell you that there will be a new fragrance that I think every guy should have this season. There will also be a pair of kicks that's made from recycled materials. And lots more. So subscribe to the RSS feed, follow me on Twitter @istyleu, and spread the word to your friends and families. You do want to get a present you like, right? As a menswear style blogger, I've been waiting for GotStyle's show since I registered for LG Fashion Week a month ago. Canada, in general, is not known for menswear. So its good to see a show who's goal it is to expose the great designers in this category. Melissa Austria, owner of GotStyle menswear store on King Street West in Toronto gathered the best of the best in menswear Friday night. Grouped in four Canadian seasons (all showing Spring-Summer collections), the show featured pieces from Christopher Bates, Costa Pavlou, Bustle, Skmpeez, Red Canoe, Juelz Rok, Gregory Allen, Juzd, 1921 jeans, 18 waits, Maison St. Pierre, Kwasi, Lipson, Trepaul and Empire Clothing. Outside of the generic models, the show was infused by local male celebrities like Nico Archambault from So You Think You Can Dance, Michael Landsberg from Off the Record, David Clemmer and Bruce Turner from Style by Jury and Ben Mulroney, host of E-Talk and Canadian Idol. I spoke to Melissa during my visit to their store a few days prior to the show. She gave me a personal tour after the interview and we discussed the growth of menswear in Canada. "Canadian menswear is growing. The problem is that they're known more outside of Canada than it is here." said Austria. 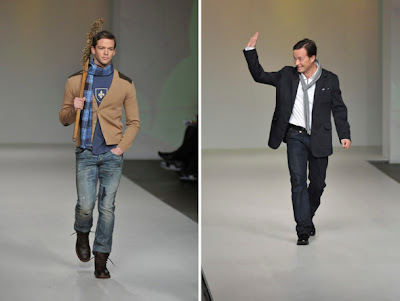 "I did this show primarily because I made it my mission to promote the great menswear design talent we have. And as a store we carry all of these emerging brands and we're proud of that. ", she added. 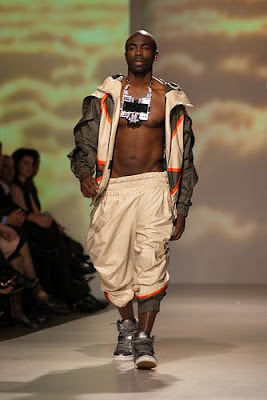 Out of all the labels on the runway, one that really stood out for me was Red Canoe. A label born in Northern Ontario, the line takes its inspiration from the Canadian outdoors and the people who live and enjoy them; fishermen, aviators, hunters, and tourists. Its that adventurous spirit that lives in the defined outdoor clothing that easily been worn in cottage country and the city. Patched sweaters, polos and full size leather back packs are things to definitely look forward to from this label. Also, the use of logos from vintage Royal Canadian Mounted Police (RCMP) insignia and Cesna plane, was unique and well placed across the tees and jackets. Can't wait till they open their store in Whistler, BC in time for the 2010 Winter Olympics. I asked Melissa what she would advice the male readers of ISTYLEU. And she mentioned the following 3 points which I think all of you should take to heart. 1) Its all about the FIT. 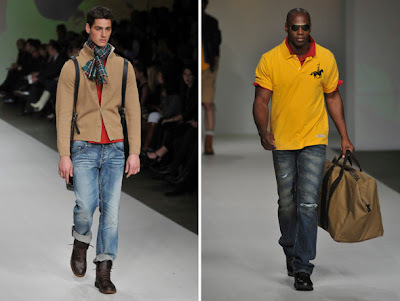 Wearing pants, shirts, jackets, sweaters a size bigger looks tacky. Look clean and sophisticated at all times. 2) Have a perfectly tailored black suit. It will never go out of style. 3) Invest in more than one coat. Coats make a great add on to a suit or a casual ensemble. Trench, Car and Overcoats are just some of your options. We are nearing the end of fashion week and the shows still keep getting better. I was really looking forward to the last two shows of the evening and I wasn't disappointed when the time came. 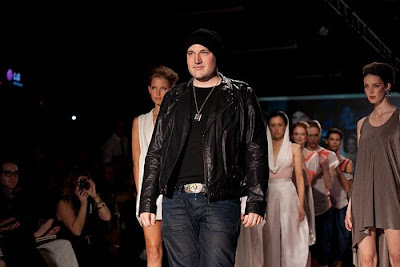 Evan Biddell, another graduate of the hit show Project Runway Canada, not only showed a great collection but more importantly delivered a great production. Starting off with an animation clip, almost very superhero like, it made wonder if the theme for the collection was that of superheroes. Well, there were some elements that were of the "leap tall buildings" kind. 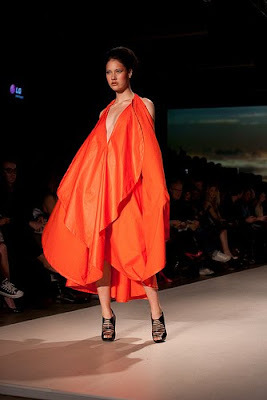 From billowy dresses, capes, hoods, and jumpsuits, Evan has once again outdone himself. There were also steel-like one piece swimsuits that look slick and powerful. Staying true to his design aesthetic of urban elegance with a hint of fantasy and futurism, each piece kept the audience in awe. And he even did a bit of menswear too with the matching jumpsuits. I asked Evan "what's with the jump shorts?" And he coyly answered "The women have been doing it for a long time. Why can't men." Good answer, Evan. 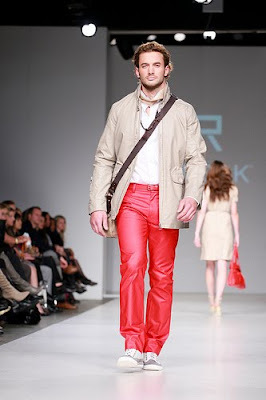 Following Evan Biddell was Evik Asatoorian and his label Rudsak. Rudsak is known for its simplicity, elegance and clean yet distinct lines. And this season, those characteristics were quite obvious. Think your most classic pieces like the trench coat and the belted dress for the women, and the safari coat and the bahama short, add some lamb skin leather, and a dash of chilli red or mushroom colored dye, and you've got a preview to Evik's Spring 2010 line. The theme revolved around jetsetting in the 60s where a couple would ride into the sunset on a private jet and in some cases maybe a vintage motorcycle. The collection had a bit of both settings. The women wore belted dresses combined with leather coats and bomber jackets. My favorite piece was this chili pepper belted leather dress. 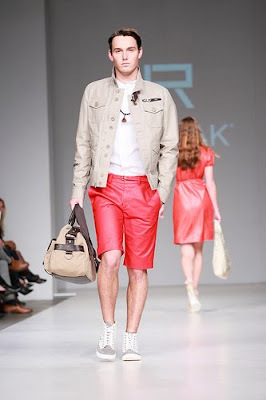 Staying on the chili pepper color block, I personally love the red shorts and pants the male models wore. Combined with beige or mushroom colored jackets, it made me want to go on a luxury vacation. I spoke with Evan after the show what his advice is for people who are scared to wear colored leather pieces, be it a jacket or a pant. He said "We've come a long way with leather and the quality of the material. 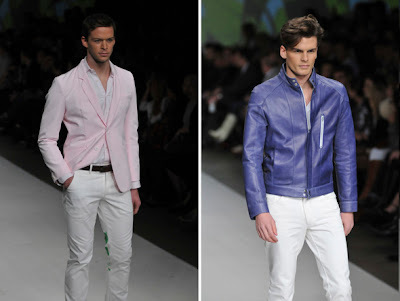 Having a colored leather jacket is a must in the Spring. There is no in-between seasons in Canada or when wearing a leather piece. For both men and women, having the right fit is also very important. Its time that individuals seize the day, be more courageous, more daring, more personal with fashion. The pieces this season accomplish that."